. : Everyone Everywhere Blog Tour: "Obama House, Fukui Prefecture"
Everyone Everywhere Blog Tour: "Obama House, Fukui Prefecture"
So, seriously, have you been on the Everyone Everywhere blog tour yet? 10 blogs united to debut one each of the 10 tracks comprising the Philly-based indie punk act's superlative self-titled set due next week? We're the final piece in the puzzle: if you hit all the links below you'll be able to consume some nice bloggin' and pick up the first nine songs from the forthcoming full-length at one and the same time. It's so win-win, we think we should call it win-win-win. MP3s for all the songs will be available at the individual sites for download until May 4, at which time the files get yanked and Pun Canoes begins streaming the record. Clicky Clicky is the last stop on the tour, so if you haven't circumnavigated the links below yet, we'll wait. 02. "Raw Bar OBX 2002' @ Can You See The Sunset? Which brings us to track 10, the amazing "Obama House, Fukui Prefecture." This song, perhaps more than any other on Everyone Everywhere's stellar debut, hits a well-defined musical sweet spot of ours: the juxtaposition of almost detached, murmured vocals underpinned by driving, heads-down rock. When fronter Brendan McHugh dreamily professes "I've never built a house myself..." as the band bashes away, guitars blazing, it's magic. It also sort of winks in the direction of the close of the excellent track "Thermal Dynamics" from the act's 2008 A Lot Of Weird People Standing Around EP. The icing on the cake that is "Obama House, Fukui Prefecture" is a sly little production touch, first encountered by us in the opening track of Death Cab For Cutie's wonderful We Have The Facts And We're Voting Yes, wherein the equalization or mix on the drums shifts from your typical pop sound to a clobbering, roomy treatment. Rather than throwing the switch after the opening verse as Death Cab did, Everyone Everywhere waits until the thundering climax of "Obama House, Fukui Prefecture," knocking the proceedings slightly sideways to delicious effect. Anyway, grab the track at the link below for a limited time, then pre-order the collection at the other link. 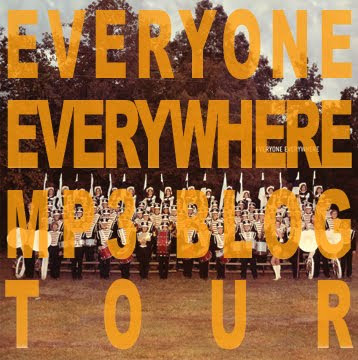 Everyone Everywhere is available digitally and on limited-edition, colored vinyl (350 maroon, 150 white). The band launches a short strand of tour dates May 7 that includes a Memorial Day weekend stop at Boston's O'Brien's Pub; all of the dates are listed below.